"Someday my Prince will come… but in the meantime, I don't let myself go ! A princess must look as beautiful as possible." All little girls dream of princess and prince charming. For all stickers, E-Glue chooses not to depict humans so that children can directly look to the illustrated scenes and not transfer themselves to a character. 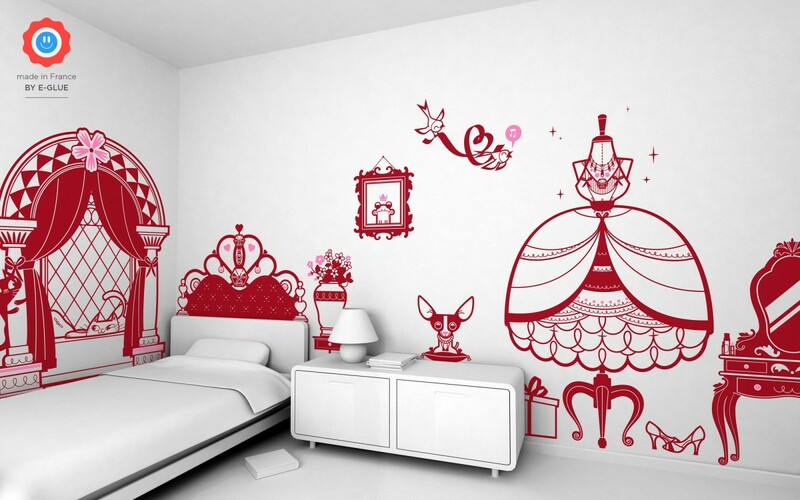 Choose this princess wall decals to decorate your girl’s bedroom. Here, no Disney, she’s the Princess, it’s her castle decoration to live her own fairy tale ! For example, see below a wall decal Bed Head (dark red and soft pink) applied on a light grey wall.